Thank DemocracyNow.org for FINALLY presenting a segment featuring Cowspiracy and urge them to provide more coverage of the devastating impacts on the planet from people eating animals. Watch the interview at DemocracyNow. Visit COWSPIRACY: The Sustainability Secret. Buy and share the video! AMY GOODMAN: As California experiences a massive drought, we examine the overlooked link between water shortages, climate change and meat consumption. With some 98 percent of the state suffering from a water crisis, California Gov. Jerry Brown ordered residents and businesses to cut water use by 25 percent. It is the first mandatory statewide reduction in California’s history. One group not facing restrictions is big agriculture, which uses about 80 percent of California’s water. According to The Pacific Institute, 47 percent of a Californians’ water footprint is in meat and dairy products. We are joined by Kip Andersen and Keegan Kuhn, directors of the documentary, "Cowspiracy: the Sustainability Secret." The film contends livestock is the leading cause of deforestation, water consumption and pollution despite many environmental organizations’ relative silence on the issue. AARON MATÉ: One of the worst droughts in decades continues to ravage California. Some 98 percent of the state is now suffering from a water crisis. Last week, California Governor Jerry Brown ordered residents and businesses to cut water use by 25 percent. It’s the first mandatory statewide reduction in California’s history. One group not facing restrictions is big agriculture, which uses about 80 percent of California’s water. Some have criticized Brown for not capping water usage by corporate farms that grow water-intensive crops such as almonds, pistachios, and alfalfa hay which is exported to China to help feed the country’s growing herd of dairy cows. A recent documentary looks at the link between climate change and livestock. The documentary is called, "Cowspiracy: the Sustainability Secret." It contends livestock is the leading cause of deforestation, water consumption and pollution despite many environmental organizations’ relative silence on the issue. This is part of the film’s trailer. DR. RICHARD OPPENLANDER: There is suppression and mismanagement of information everywhere. It abounds. INTERVIEWEE 1: It starts at the local level, but then it goes all the way to Congress. INTERVIEWEE 2: When you consider the devastation it’s having on our planet as well as the oceans. DR. WILL TUTTLE: We’re in the middle of the largest mass extinction of species in 65 million years. INTERVIEWEE 3: They can dictate the federal policies because they have so much political power. WILL POTTER: One of the largest industries on the planet, the biggest environment impact, trying to keep us in the dark about how it is operating. RECORDED VOICE: Unfortunately, we are no longer able to fund your film project. We had a meeting and due to the growing controversial subject matter we have some concerns and have to pull out. WILL POTTER: You’re going up against people who have massive legal resources and you have nothing. INTERVIEWEE 3: A lot of people just keep their mouth shut because they don’t want to, they don’t want to be the next one with a bullet to their head. AMY GOODMAN: That was part of the trailer for the recent documentary, "Cowspiracy: the Sustainability Secret." According to The Pacific Institute, 47 percent of a Californian’s water footprint is in meat and dairy products. For more, we go now to San Francisco, California where we’re joined by Kip Andersen and Keegan Kuhn. They are the award-winning directors of the documentary film. Kip Andersen and Keegan Kuhn, welcome to Democracy Now! Talk about what is causing the drought in California and what you have documented, you believe contributes so much to it. KEEGAN KUHN: You know, the drought in California is being caused primarily from climate change and there is not enough rainfall. Average rainfall has decreased. But really what we’re dealing with is water shortage, not only just a drought. California is using more water than it actually has available to it. And as you said, 47 percent of a California’s water footprint is made up in meat and dairy products. So these are very water intensive products, and that Californians and Americans are consuming which, again, is exacerbating the already drought conditions. AARON MATÉ: And Keegan, how does livestock compare to other environmental dangers like fracking, for example? KEEGAN KUHN: You know, fracking is a great example. Fracking gets a lot of attention because of water use. Fracking uses about 100 billion gallons of water every year in the U.S., which is a tremendous amount of water, but animal agriculture uses in excess of 34 trillion gallons. So it’s magnitudes greater. And then again the emissions that come from animal agriculture are about equal to natural gas and petroleum production. So it’s an issue that is vastly more destructive when it comes to water consumption, water pollution, and even emissions. AMY GOODMAN: Let’s go to a clip from "Cowspiracy." Here our guest, Kip Anderson, the film’s Co-director, explains how much water goes into producing a hamburger. KIP ANDERSON: I found out that one quarter pound hamburger requires over 660 gallons of water to produce. Here I’ve been taking the short showers trying to save water and to find out just eating one hamburger is equivalent of showering two entire months. So much attention is given to lowering our home water use, yet domestic water use is only 5% of what is consumed in the U.S. versus 55 percent for animal agriculture. That’s because it takes upwards of 2500 gallons of water to produce one pound of beef. I went on the government’s Department of water resources save our water campaign where it outlines behavior changes to help conserve our water like using low flow shower heads, efficient toilets, water saving appliances, and fix leaky faucets and sprinkler heads, but nothing about animal agriculture. When added up, all of the government’s recommendations, I was saving 47 gallons a day but still that is not even close to the 660 gallons of water for just one burger. AMY GOODMAN: That’s Kip Andersen in the film "Cowspiracy." Kip is with us as well, in San Francisco. So how does the mandate, the 25% decrease in water, affect — does it affect animal agriculture, as you call it? KIP ANDERSON: — being concerned about having one glass of water, let’s cut down on the dairy as well. AMY GOODMAN: Why is that? Why does it take that much water? KIP ANDERSON: It takes that much water because the animals have to be fed grains or feed of some type. Alfalfa is an incredibly water-intensive crop. Actually uses — alfalfa which is fed primarily to livestock — uses 10 percent of all of California’s water — or 15 percent, excuse me. So the water footprint that’s embedded in the products that the animals are eating goes on to animal product and then on to the consumer. So again, looking at a pound of beef in California takes from 2500 to 8000 gallons of water to produce. These are extremely water intensive products. 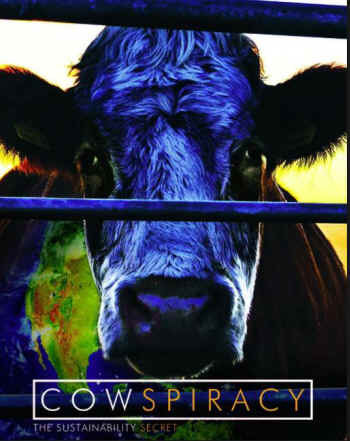 AMY GOODMAN: Well, in this clip from "Cowspiracy," we hear from a Dr. Richard Oppenlander and Dr. Will Tuttle. They described how animal agriculture is leading to the extension of species and destruction of large swaths of forested land. DR. RICHARD OPPENLANDER: Concerned researchers of the loss of species agree that the primary cause of loss of species on earth that we are witnessing is due to overgrazing and habitat loss from livestock production on land and by overfishing, which I call phishing in our oceans. DR. WILL TUTTLE: We are in the middle of the largest mass extinction of species in 65 million years. The rain forest is being cut down at the rate of an acre per second and the driving force behind all of this is animal agriculture, cutting down the forests to graze animals and grow soybeans, genetically engineered soybeans to feed to the cows and pigs and chickens and factory farmed fish. AARON MATÉ: Keegan, can you comment on this, how livestock actually contributes to the extinction of other parts of the species on a mass scale? More of the interview is available by watching the rest of the interview at DemocracyNow.